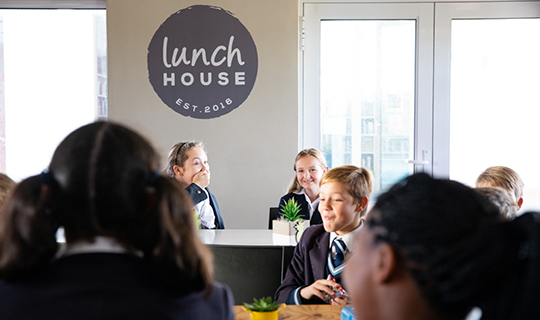 Welcome to Lunch House at Kirstenhof Primary School, launched in January 2017. A nutritional eating hub where learners meet healthier options, good food meets technology, parents meet convenience and friends meet friends. Lunch House provides nutritious meals through a pre order system as well as on demand. Each term an order form is published which shows the many options available. Payment can happen through the biometric system as well as with cash. Use of the biometric system requires registration which is facilitated by the Lunch House staff. Biometric Registration allows parents to control how much money is spent as well as the ability to restrict certain items. Parents and other visitors are encouraged to make use of Lunch House in the afternoons where they can purchase a great cup of coffee and a bite to eat. If there are any questions relating to Lunch House or if you wish to place an order, contact Liz on email at liz@lunchhouse.co.za. Why is a healthy tuck shop important? Children learn in school about good nutrition and how to make healthy eating choices. The school environment needs to properly support this education by ensuring that food provided on the school grounds are in line with the accepted guidelines for children’s nutrition. Children need access to healthy options. Research shows that having lots of opportunities as a child to make healthy food choices has a big impact on whether healthy eating becomes a life-long habit. People often assume healthy means more expensive however Lunch House has developed ways to provide affordable good food. Good food equates to good health. Children are most vulnerable to poor nutrition, both because they cannot control their sources of food and because their bodies are still growing. Good food is a basic requirement for the growing of healthy bodies and it is essential if children are going to learn well. As the seminal places of learning, schools play a critical role in ensuring that children have healthy bodies and minds.